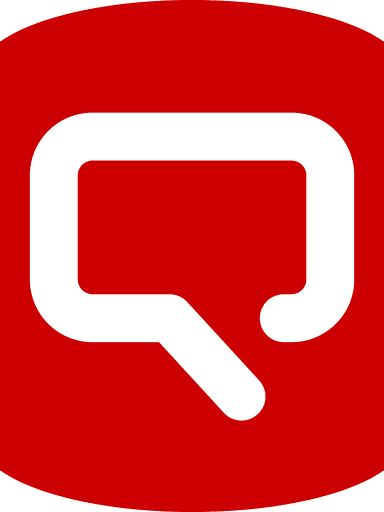 Writing aggregate queries is one of the most important tasks for anyone working with T-SQL. Determining the expressions required in the GROUP BY clause is not that difficult, but what do you do if you need to include different combinations of group by expressions in the same result set? 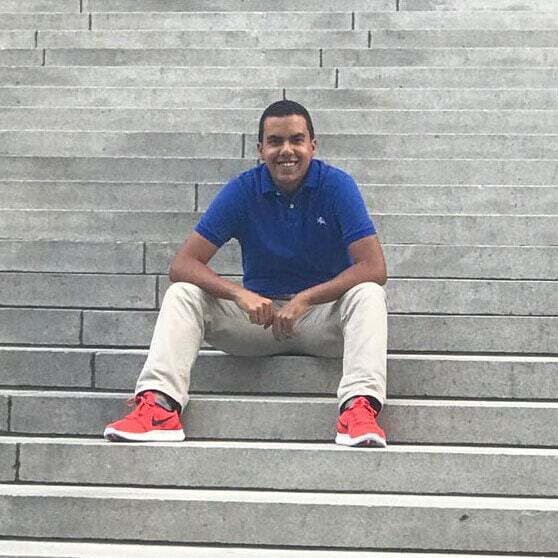 Alfonso demonstrates how to use the GROUPING SETS operator to accomplish this task. Maybe you have felt overwhelmed when you’re analyzing a dataset because of its size. The best way to handle this situation is by summarizing the data to get a quick review. In T-SQL, you summarize data by using the GROUP BY clause within an aggregate query. This clause creates groupings which are defined by a set of expressions. One row per unique combination of the expressions in the GROUP BY clause is returned, and aggregate functions such as COUNT or SUM may be used on any columns in the query. However, if you want to group the data by multiple combinations of group by expressions, you may take one of two approaches. The first approach is to create one grouped query per combination of expressions and merge the results using the UNION ALL operator. The other approach is to use the GROUPING SETS operator along with the GROUP BY clause and define each grouping set within a single query. All queries in this article will run in the AdventureWorks2012 database. If you wish to follow along with this article, download it from here. Table 1. Company’s income per year. According to Table 1, the company have been registering income between 2005 and 2008. Assuming that the currency is in US dollars, in 2005 their income was around eleven million dollars. In 2006 it was around thirty million dollars, and so on. This kind of information would be useful for supporting a business decision such as opening a company extension elsewhere. However, if you still want more details about the company’s income, you must perform a new grouping by adding a column or expression to the GROUP BY clause. Add the order month to the previous set of group by expressions. By doing this, the query will return the company’s income per year and month. Review the GROUP BY clause in the following query. Query 2. Company’s income per year and month. Table 2. Company’s income per year and month. This result set is more detailed than the former. In July 2005, their income was around nine hundred sixty thousand dollars. In August 2005, it was around two million dollars, and so on. The more expressions or columns added to the GROUP BY clause, the more detailed the results will be. If you observe the structure of the two queries, you will see they’re grouped by a single set of grouping expressions. 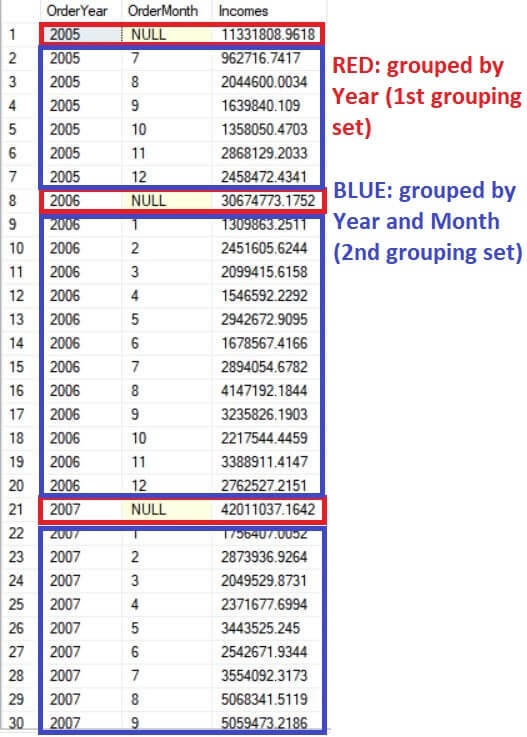 The former is grouped by order year, and the latter is grouped by order year and month. Query 3. Company’s income per year and per year and month. Figure 1 shows the result set produced by Query 3. Review the comments in the figure which identify the grouping sets. Figure 1. Company’s income per year and per year and month. Notice the comments added to the figure. This information doesn’t look new, because you already know that in 2005 the company’s income was around eleven million dollars. In July 2005 the company’s income was around nine hundred sixty thousand dollars, and so on. What’s new to you is that each grouping result –year grouping result and year and month grouping result– is merged. Maybe you’ve figured out how the NULL values appeared in the result set. 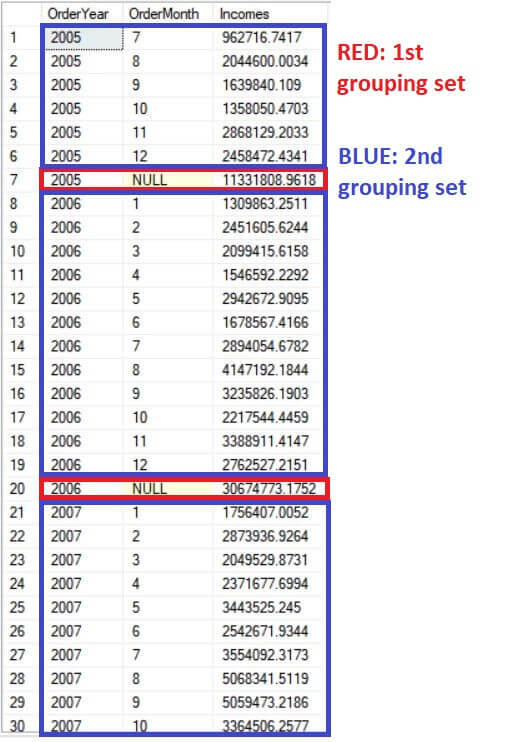 Remember you used the NULL as a dummy column to identify the results from the order year grouping. 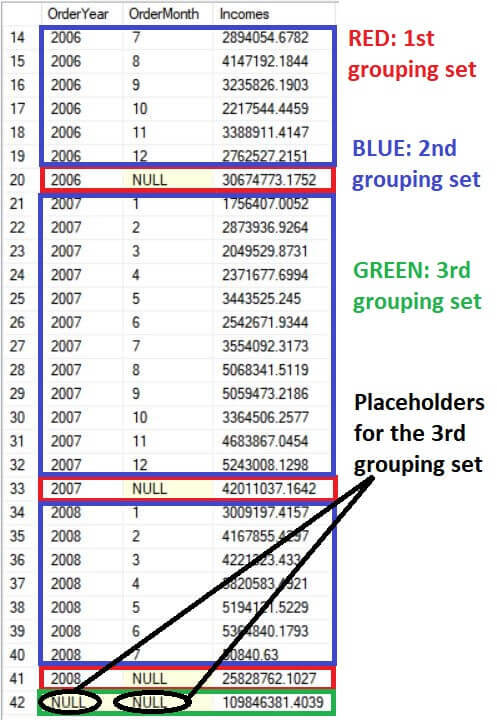 Look carefully at Figure 2 which details the placeholders in the first grouped query. Figure 2. Pointing out the placeholders. When there’s more than one group by expression list involved in the query, a NULL is used as a placeholder to identify one of the groupings in the results. 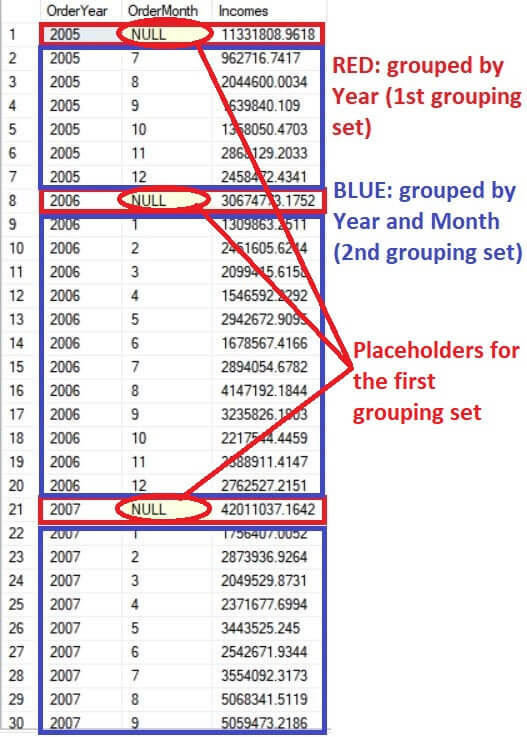 Looking at Figure 2 again, a row that has NULL in the OrderMonth column means the row belongs to the order year grouping. When the row has a value in both the OrderYear and OrderMonth columns, it means the row belongs to the order year and month grouping. This situation happens when one of the grouped queries doesn’t have the same number of columns grouped. In this example, the first grouping is by order year and the second grouping is by order year and month. Query 4. Getting the same result set produced by the Query #3 but using the GROUPING SETS clause. The result set produced by Query 4 is the same as that displayed in Figure 1. Figure 3 shows the results, but the new technique requires less code. The GROUPING SETS operator is used along with the GROUP BY clause, and allows you to make multi-grouped queries just by specifying the grouping sets separated by comma. However, you need to be careful when specifying the grouping sets. For example, if a grouping contains two columns, say column A and column B, both columns need to be contained within parenthesis: (column A, column B). If there’s not a parenthesis between them, the GROUPING SETS clause will define them as separate groupings, and the query will not return the desired results. Figure 3. Company’s income per year and per year and month using the GROUPING SETS clause. Query 5. Company’s income per year, per year and month, and overall. Notice the placeholders for the third grouping shown in Figure 4. The query calculated the grand total of incomes by just specifying an empty parenthesis as the third grouping set; the third grouping set is the sum of SubTotal for the table itself. Figure 4. Company’s income per year, per year and month and all over the time. By the way, if you’ve asked yourself “What would happen if the NULL is part of the data and isn’t used as placeholder?” or “How can I tell when NULL is used as placeholder or is just the value?” In this example, I ensured that the grouped columns aren’t nullable, so the NULLs are used as placeholders. In case the grouped columns are nullable, you will need to use the GROUPING or GROUPING_ID function to identify if the NULL came from the GROUPING SETS operator – it can also come with other groupings operators like ROLLUP and CUBE– or is part of the data. Both functions – GROUPING and GROUPING_ID– will be treated in another article. In this article, you learned how to achieve an aggregate query with more than one grouping expression list by using the GROUPING SETS operator. Unlike other operators such as ROLLUP and CUBE, you must specify each grouping set. These grouping operators are very important for summarizing data and producing grand totals and sub totals. If you want more information about these operators, please read this article. I suggest that you practice what you’ve learned in this article; this topic is very important for anyone working with SQL Server data. The data volume is increasing very quickly, and it’s vital to summarize it for better knowledge about the business. Which versions of SQL Server does this apply to ? Grouping Sets feature were introduced in SQL Server 2008. Perhaps it’s just because of the example you chose, but I really don’t understand how this buys you anything over and above what WITH ROLLUP would do. Apparently GROUPING SETS can select more disjoint ways of summarizing. For example this SQLFiddle http://sqlfiddle.com/#!6/73badb/1 will subtotal the source data by one field (only), then by another field (only), and finally a grand total. That’s more than WITH ROLLUP could do. The article should say something about this at least.